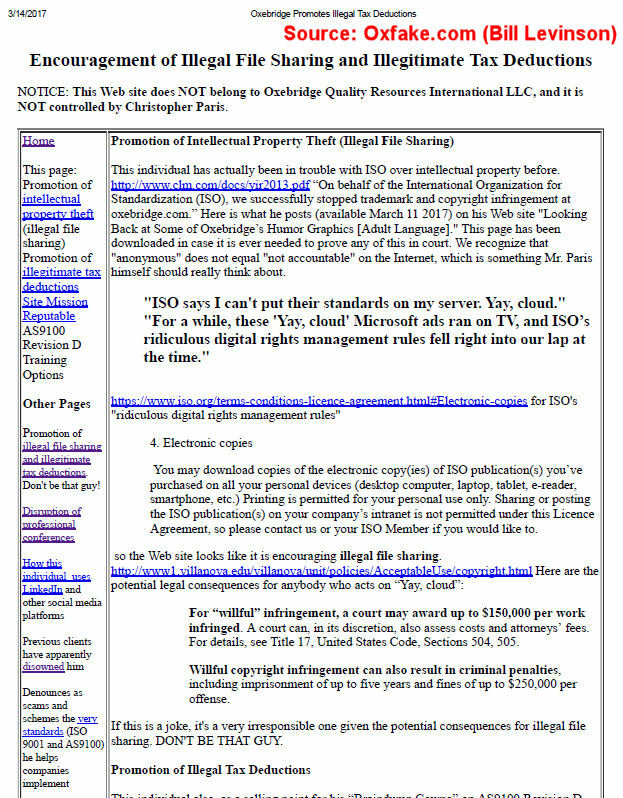 In what’s becoming a regular series, we’re forced again to confront another pernicious and defamatory claim made by ASQ’s Bill Levinson: that Oxebridge illegally distributed copies of an early draft version of ISO 9001:2015, in violation of ISO’s copyright. Levinson has made the claim repeatedly on Twitter, Facebook, LinkedIn, Ripoff Report, his three defamation sites (Oxebridge.biz, Oxfake.com and Osteinfo.net), as well as in his numerous court-related filings. The claim is absolutely false, and Levinson is now facing a Federal defamation charge as a result, all while he actively undermines his own defamation suit against Oxebridge. You have to imagine Levinson’s lawyer, Mark Tischhauser, pleading with his client to just STFU already. It’s not working. Page from Levinson’s “Oxfake.com” website, falsely accusing Oxebridge of intellectual property theft. Click to enlarge. Levinson’s version of events is this: using as his only evidence a single DMCA notice that was previously published on our own site, in which ISO’s law firm Carter, Ledyard and Milburn (CLM) claimed we had infringed their copyright, Levinson assumes the charge was absolutely true. He doesn’t bother understanding that an entire months-long process went on afterwards, or the end result which found Oxebridge innocent of the charge. Yet again, Levinson’s limited brain can only process information that supports his predetermined view, while rejecting third-party facts that prove otherwise. And remember, he claims to be an expert on risk management, which relies on gathering facts objectively and analyzing them accurately. Here’s the real story. In the early ramp-up days of the development of ISO 9001:2015, we published both the Working Draft (WD) and the Committee Draft (CD) of the ISO 9001:2015 standard. At the same time, we published the infamous “Public Call” white paper, pleading with ISO to stop development of ISO 9001 temporarily because it was clear they were ignoring stakeholders. That document received so much distribution, it forced the Chairman of TC 176 to make a rare public statement denouncing it. ISO was furious, and began sending threatening emails on a variety of subjects, only one of which was threats of copyright infringement. 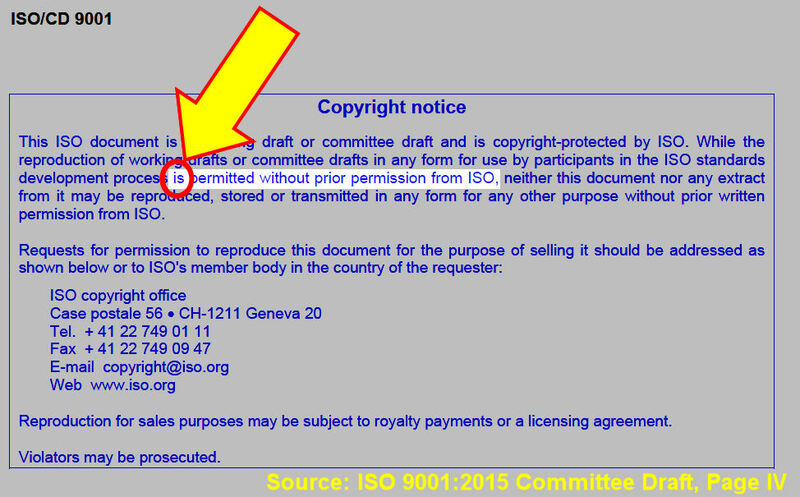 This ISO document is a working draft or committee draft and is copyright-protected by ISO. While the reproduction of working drafts or committee drafts in any form for use by participants in the ISO standards development process is permitted without prior permission from ISO, neither this document nor any extract from it may be reproduced, stored or transmitted in any form for any other purpose without prior written permission from ISO. Requests for permission to reproduce this document for the purpose of selling it should be addressed as shown below or to ISO’s member body in the country of the requester. Reproduction for sales purposes may be subject to royalty payments or a licensing agreement. Violators may be prosecuted. This document is not an ISO International Standard. It is distributed for review and comment. It is subject to change without notice and may not be referred to as an International Standard. Levinson interprets words like “is permitted” to mean the exact opposite (“is not permitted”) when it suits his fancy. But that doesn’t change what actually appears in the document. The statement does restrict the distribution of the CD only when being distributed for “any other purpose” other than “for use by participants in the ISO standards development process.” This, too, Levinson fails to understand, despite it appearing in simple English right on the page. This might be why he wrote an entire book on ISO 9001 based on a draft, and not the actual standard. Doh! Many members have public review procedures for making draft standards known and available to interested parties and to the general public. The ISO members then take into account any feedback they receive in formulating their position on the draft standard. An enquirer could get hold of a copy of CD 9001 via their member body. It would be up to the MB to decide whether the consultation is open to the general public at that stage or just to the national mirror committee. In any case, any member of the public will be able to access the DIS via their MB as this is the public enquiry stage. While ANSI chose not to distribute the document publically, other countries were not so inclined, and instead distributed the WD and CD directly to the public, through representatives of their member bodies. This was also fully legal, per the copyright disclaimer on the standard itself. For Oxebridge, we received the WD and CD from official member body representatives from France and South Africa (and probably a few others, I forget) with express permission to distribute it for public commenting. So we were in full compliance with ISO’s copyright. Since we didn’t sell it, we didn’t run afoul of the last sentence in the disclaimer, either. The same would not have been true for the subsequent DIS version, which then falls under tighter copyright provisions and is only offered for public commenting through the member body, and typically sold, not given out freely. That’s why we never published anything after the CD version. So Levinson’s argument falls flat when examined from ISO’s own procedures, emails from the actual TC 176 Secretary himself, and the literal words that appear on the document itself. Meaning it’s wholly untrue, and thus he’s publishing intentionally false information. Making matters worse, Levinson has admitted — in one of those many “pre-suit notices” that his attorney must absolutely loathe — that he did so with the intention of assuring I “had less O-Fans.” Yes, the guy literally published his malicious intent. So CLM was waved off, and dropped the complaint entirely. The lawyer who wrote the letter was no longer working for CLM a few months later, although we have no idea if that’s related. Where things got sticky was that later, CLM published an annual report that included the bizarre statement that it had “successfully stopped trademark and copyright infringement at oxebridge.com.” The claim was also wholly untrue, and initial attempts to get CLM to remove the document failed. At which point we filed an official complaint with the New York Bar, citing CLM for deceptive marketing and defamation. We can’t be sure if that worked, but suddenly CLM was responding to my emails, and on March 16th 2016, they pulled the document from the CLM website entirely. Levinson, along with Daryl Guberman, keep republishing the document as if it were fact, making them — again — subject to defamation suits. They intentionally misrepresent the CLM document as being accurate, when even CLM acknowledged it wasn’t. Note that he just outright makes up the part about the CD having a “one-user license” when the actual document says nothing of the sort. This puts Levinson in a very awkward box, in that he stated the false claim as absolute fact, thus ensuring it is treated as defamatory. What’s especially stunning is that Levinson’s investigatory skills involve him taking stuff my our website — ironically, in violation of our copyright — and assuming that it harms us, as if Oxebridge would publish material that harms itself. This is in keeping with his batshit insane theory that we hacked our own website. In reality, the documents and images he keeps stealing from the Oxebridge site disprove his claim, but his crippling confirmation bias prevents him from seeing the facts before his very eyes. So, yet again: will Levinson publish an apology and retraction, as he demands from Oxebridge every time we mention his name? Will he retract those Ripoff Report postings? Will he dismantle his osteinfo.net website? I suggest he do so or, at the very least, just start practicing writing checks made out to “Oxebridge Quality Resources International LLC.” I’ll be grading them for penmanship. UPDATE 1/3/2018: In response to this article, Levinson wrote me the following email. It’s interesting because his crippling confirmation bias continues to prevent him from seeing words in front of his face. He says that we published the CLM letter, but fails to note that it was published as part of this article, which is headlined “Oxebridge Defeats Legal Move That Would Have Threatened Entire Industry.” So Levinson can see the CLM attachment, but not the headline and the actual article itself, which shows how that ISO was “defeated” and the entire claim dropped. In real life, cease and desists (as well as DMCAs) are sent all the time, and ignored or thrown out. I sent a DMCA notice to Levinson, and he is doing exactly that. 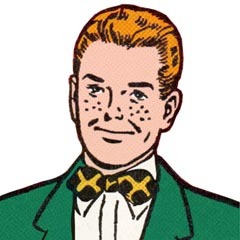 But in his mind, ISO sent a nastygram, and therefore Oxebridge is guilty. I can’t wait to see this guy testify. It’s going to be a spectacle. Levinson now faces problems with ISO’s law firm, Carter Ledyard & Milburn, for potentially distributing their copyrighted document without permission. Also, who the hell faxes nowadays? That crime alone should see Levinson locked up for luddism.